Shure introduced a new digital signal processor designed to deliver excellent sound quality and intuitive setup and operation for conference rooms. Launched earlier this year at the ISE in Amsterdam, Shure’s IntelliMix P300 audio conferencing processor has been created specifically for conferencing applications. 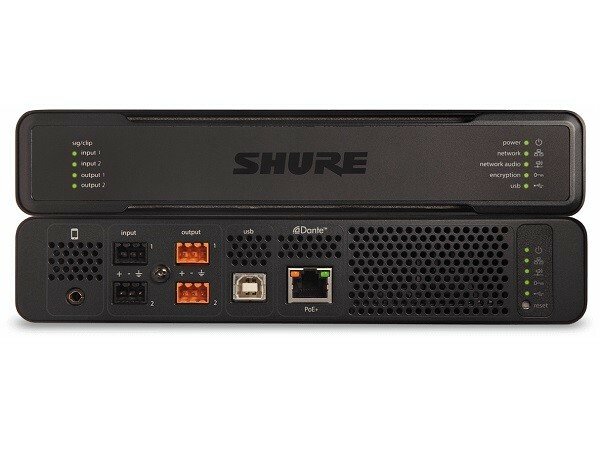 In addition to Shure IntelliMix DSP algorithms that significantly enhance the audio quality in video meetings, the P300 also offers a variety of connectivity options, plus seamless operation with Shure Microflex Advance and Microflex Wireless microphone solutions for AV conferencing. Team collaboration in the modern agile workplace has expanded from purpose-built video conferencing rooms to impromptu meetings held in flexible workspaces throughout the office. Programming and setting up premium audio processors may not always be practical or cost-effective in these pop-up conference rooms. Such situations demand the simplicity of the compact IntelliMix P300, a solution that provides professional conferencing technology with just the right set of features to create a highly intelligible, collaborative meeting experience in these temporary spaces. Key features of Shure’s IntelliMix P300 audio conferencing processor include ability to connect up to eight Dante microphone channels to a room video system, USB soft codec, or mobile device; each channel supporting multiple IntelliMix DSP features, including Acoustic Echo Cancellation (AEC), Noise Reduction, and Automatic Gain Control, plus best-in-class automatic mixing to provide full duplex communication for echo and noise free meetings; simple and intuitive setup, resulting in less DSP programming and commissioning time onsite; and USB connectivity enabling the use of the processor with common soft codec programs such as Skype and BlueJeans. The IntelliMix P300’s 3.5mm connector allows anyone on a mobile phone or tablet to easily bring any remote participant into the conversation. Its compact half-rack footprint enables discrete installation behind a display, under a table, or in a credenza. Observing that great audio should not be reserved only for boardrooms, Shure Product Manager Paul Gunia says they have developed a powerful yet simple-to-configure DSP that complements their networked microphone systems. A conference room designed with Microflex microphones and an IntelliMix P300 processor will provide a full Shure audio solution, without involving extensive program training or installation considerations. He adds that Shure’s new solution will enable rooms of any size to fully support a quality audio conference call. Additionally, Shure also introduced the ANIUSB-MATRIX and ANI22 at the ISE. The ANIUSB-MATRIX provides flexible routing of up to four Dante audio inputs and one analogue input to a room video conferencing system or a soft codec. This device is ideal for accommodating small to medium sized rooms intended for audio and video conferencing. With fewer features compared to the P300, the ANIUSB-MATRIX offers the ideal performance, connectivity, and affordability for video conferencing where a premium microphone solution is desired, but acoustic echo cancellation of a hardware or software codec will be used. The ANI22 provides Dante-to-analogue signal routing that enables two audio channels to be routed on and off a Dante network. These additions to the ANI family increase the connectivity options available to users of Shure’s Dante-enabled microphones. Shure products are available in Australia from Jands, a leading distributor of professional sound, lighting and stage systems.